Family Guy have done a Star Wars episode! Everyone knows Blue Harvest was the name God used when creating Return of the Jedi to keep obsessive fans from flocking to the set during production. 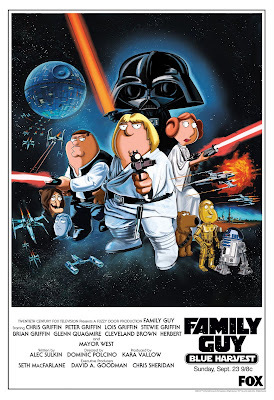 The Family Guy season six premiere was shown on Sunday in the US was a retelling of Star Wars Episode IV with characters on the show portraying those in the film. I prefer American Dad as a series but I was in stitches at this FG episode, I suggest you seek it out now. Sunday night’s Star Wars edition of Family Guy was the series’ highest-rated installment since returning to Fox in 2005, and a parody of The Empire Strikes Back seems likely,” a Fox source tells says. Shoot 'Em Up: Eat your carrots!